The GCC lubricant packaging market is characterized by the high preference for plastic packaging solutions for lubricants, such as engine oil, transmission and hydraulic fluid, process oil, metal-working fluids, general industrial oil, and greases. On account of the key traits of plastic, such as rigidity, strength, and chemical resistance, the demand for plastic material for the packaging of lubricants has increased substantially, impelling the GCC market for lubricant packaging. With the increasing government initiatives and spending on non-oil industries, the growth in this market is likely to rocket in the years to come. In 2016, the market stood at US$162.7 mn. Proliferating at a CAGR of 3.30% between 2016 and 2024, its value is likely to shoot up to US$210.4 mn by the end of 2024. Stand-up pouches, bottles, drums, pails, cans, tubes, kegs, bag-in-box, and intermediate bulk containers are the main packaging types utilized for the packaging of lubricants in GCC countries. In terms of value, the pails segment has been leading the market is expected to retain its position over next few years. 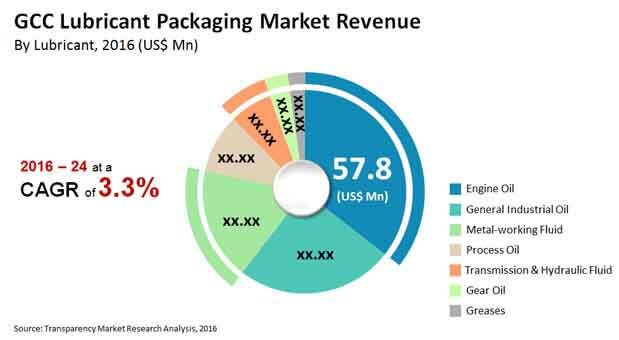 However, the demand for flexible lubricant packaging, such as bag-in-box and stand-up pouches, is also projected to gain momentum in the near future. The key types of lubricants utilized in GCC market are engine oil, transmission and hydraulic fluids, process oil, metal-working fluid, general industrial oil, gear oil, and greases. Engine oil has been reporting the most prominent demand for lubricant packaging in GCC countries. Thanks to the high demand for engine oil in the automotive sector, it is likely to continue registering a strong demand for lubricant packaging in the years to come. On the basis of the type of material, the GCC market for lubricant packaging is classified into metal and plastics, of which metal is sub-segmented into steel and tin. The plastic segment is also sub-segmented into polyethylene terephthalate (PET), polyvinyl chloride (PVC), polyamide (PA), polypropylene (PP), polystyrene, and polyethylene. LDPE and HDPE are the main categories in the polyethylene segment. The demand for PET packaging is higher at present and is expected to witness a strong rise in its demand over the forthcoming years, thanks to the increasing preference for PET over PP and PVC materials. The demand for HDPE is also projected to rise considerably in the near future due to the growing knowledge about its multiple usages in various industrial and consumer applications. The automotive, metal-working, oil and gas, power generation, machine, chemicals, and various other manufacturing sectors are the prime end users of lubricant packaging. The automotive sector surfaced as the key end user of lubricant packaging with a share of 36.1% in 2016 and is anticipated to gain maximum incremental opportunity in terms of market revenue over the next few years. However, the chemical industry is projected to offer the most promising growth opportunities to market players in the years to come. Some of the key players operating in the GCC lubricant packaging market are Duplas Al Sharq, Takween Advanced Industries, Saudi Can Manufacturing Company Ltd, Zamil Plastics Industries Ltd, Mold Tek Packaging Ltd, Neelkamal Plastics Factory LLC, First Press Plastic Moulders Ltd. This report provides forecast and analysis of the GCC lubricant packaging market. The study provides historic data of 2015 along with forecast from 2016 to 2024 based on volume (Mn units) and revenue (US$ Mn). It includes drivers, restraints and the ongoing trend for the lubricant packaging market along with their impact on demand during the forecast period. The report also comprises the study of opportunities available in the GCC market for lubricant packaging. It includes value chain analysis with list of raw material manufacturers, packaging manufacturers, suppliers, distributors and end users in the value chain. In order to provide the users of this report with comprehensive view of market, we have included detailed competitiveness analysis and company players. The competitive dashboard provides detailed comparison of lubricant packaging manufacturers on parameters such as company’s revenue, unique selling propositions and key strategic developments. The study encompasses market attractiveness analysis, by packaging type, lubricant type, material type and end use type. Market statistics have been estimated based on average consumption and weighted average pricing of lubricant packaging and the revenue is derived through regional pricing trends. Market size and forecast for each segment has been provided in the context of the GCC markets. The lubricant plastics packaging market has been analyzed based on expected demand. Prices considered for the calculation of revenue are average regional prices obtained through primary quotes from numerous lubricant packaging manufacturers, suppliers, and distributors. All key end users have been considered and potential applications have been estimated on the basis of secondary sources and feedback from primary respondents. Regional demand patterns have been considered while estimating the market for various end users of lubricant packaging in GCC. Top-down approach has been used to estimate the GCC lubricant packaging market. Market numbers for the GCC packaging type, lubricant type, material type and end use type segments have been derived using the bottom-up approach, which is cumulative of region’s demand. The market has been forecasted based on constant currency rates. A number of primary and secondary sources were consulted during the course of the study. Secondary sources include Factiva, World Bank, IMF reports, Philips Capital and company annual reports and publications. The report provides detailed competitive outlook including company profiles of key participants operating in the GCC market. Key players in the GCC packaging type, lubricant type, material type and end use type segments market include, Duplas Al Sharq, Takween Advanced Industries, Saudi Can Manufacturing Company Ltd, Zamil Plastics Industries Ltd, Mold Tek Packaging Ltd, Neelkamal Plastics Factory LLC, First Press Plastic Moulders Ltd.